Join us for a conversation with renowned experts on Turkey and the Middle East who will discuss Turkey's role in the current ego-political context. What can Turkey expect in the aftermath of a failed coup? What are the national and foreign policy challenges? How can Turkey cope with an ever growing stream of refugees? Our experts will weigh in on Turkey's strategic options given these uncertain times and challenges. 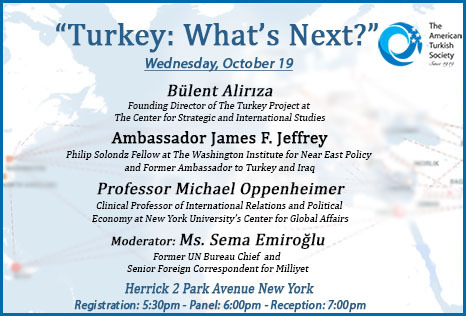 Update: We are pleased to announce that an additional panelist, Dr. Bulent Aliriza (Founding Director of The Turkey Project at the Center for Strategic and International Studies), will be joining Ambassador Jeffrey and Professor Oppenheimer in a discussion of Turkey's critical role in the current geo-political context on Wednesday, October 19. Register now!